With fall here and summer fading to memory, many of us look back fondly at another season of riding gone by and yearn to have just another week or two more. Speaking of things you’ll never actually get, check out this amazing one-off from Chromag Bikes in Whistler BC. 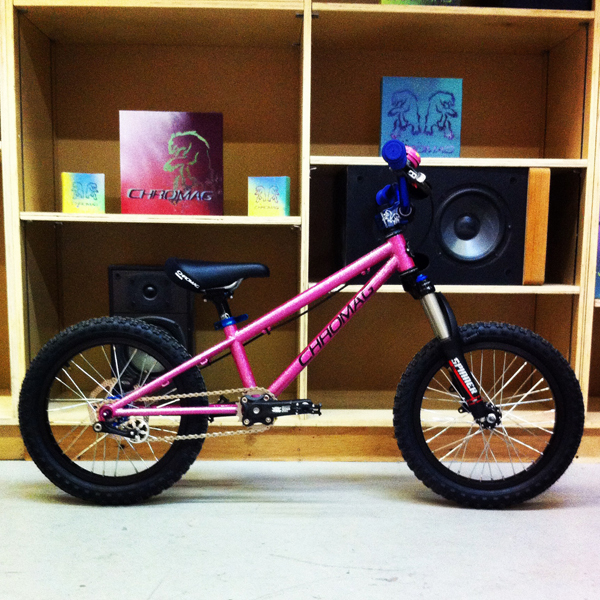 The Chromag ‘Sparkle Princess’ is a singular single-speed made for one single little girl who’s got connections. Word is that this hand-made steel hard-tail has the daycare buzzing and it’s owner sometimes has a hard time fending off the boys who are lining up to try out her sweet bike. This won’t end anytime soon as the frame is meant to accommodate both 16″ and 20″ wheels. Apologies to all the groms reading this who may have gotten their hopes up, thinking they could get their hands on a bike from Chromag without waiting to graduate to 26″ wheels first. It may be a consolation to know that while their bikes don’t, they are one of the few bike companies whose clothing comes in kid’s sizes.